Oxygen ions are constantly escaping from the Earth's upper atmosphere through the magnetic polar caps. This has long been observed but the underlying mechanism has eluded scientists - until now. A recent study reports the first experimental assessment of a physical mechanism that makes a significant contribution to the acceleration of oxygen ions towards the centre of the terrestrial magnetic tail, along magnetic field lines. This assessment was made possible as a result of several years of data collected by the European Space Agency's Cluster mission. 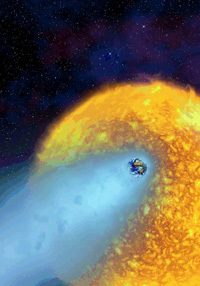 Prior to the space age, scientists believed that the magnetic environment of Earth was mainly filled with particles of solar origin forming an immense comet-like cloud of electrified gas surrounding our planet (see Figure 1). 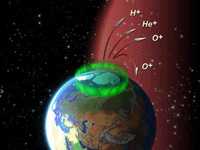 Later, observations with scientific satellites surprisingly revealed that oxygen, helium and hydrogen ions from the Earth's upper atmosphere leaked into space from regions near the Earth's poles, (see Figure 2). This is no cause for concern. This leakage is tiny compared to the volume of the Earth's atmosphere, but it has changed our vision of the composition of the Earth's environment. The magnetosphere is now known to be partially filled by a fountain of energized gas blowing from each of Earth's poles (see, for example, Huddleston et al., 2005). Satellites in the 1980s and 1990s revealed an intriguing fact about these escaping particles: the higher in altitude they are observed, the more energy or velocity they have. Some of these accelerated particles are lost in space but the rest of them accumulate in the center of the magnetic tail, or plasmasheet, and eventually return back to Earth in a kind of boomerang effect. Moreover, this input in terms of density increases significantly during periods of geomagnetic disturbance as reported by Lennartsson and Shelley (1986) who found that the average density of oxygen ions can increase by almost an order of magnitude with respect to quiet times in the plasma sheet at a distance of between 10 to 23 Earth radii (1 Earth radius or RE = 6378 km). In other words, low-energy particles from the upper atmosphere escape, are accelerated on the way, provide a significant input of matter to the plasma sheet from where some of them return back to Earth with high-energy, thus becoming a hazard for satellites and astronauts. But how can they be accelerated and escape the Earth's gravity field? Several possible acceleration mechanisms have been proposed by space scientists but determining which one is dominant, if any, is still the subject of hot debate. In spite of decades of measurements in space, this topic remains an open question due to the fact that it is experimentally challenging to assess quantitatively the role of any acceleration process. For instance, the distances involved are considerable (tens of thousands of kilometres). Moreover, this phenomenon has to be understood in terms of spatial and temporal evolution. Thus, a quantitative assessment requires several years of data collection and, ideally, data from a constellation of satellites since assumptions have to be made when interpreting data gathered by a single scientific satellite. A recent study reports the first statistical investigation of outflowing oxygen ion beams collected over a three year period (2001 to 2003) by the four Cluster satellites flying in constellation at between 5 RE and 12 RE over the polar regions. For the first time, the role of a specific acceleration process for such outflowing oxygen ions, called centrifugal acceleration (see Cladis, 1986), is quantitatively assessed in the polar cap at high altitude without any assumptions related to observations by a single satellite. "Four spacecraft was exactly what we needed to fully estimate all terms of a textbook equation describing the centrifugal acceleration mechanism, a well known physical process to accelerate outflowing oxygen ions along magnetic field lines towards the plasma sheet", comments Dr. Hans Nilsson, lead author of this study. Centrifugal acceleration can be regarded as a sling-shot effect that occurs when ions are moving across magnetic field lines, whose shape changes in the presence of an electric field. When ions move over a polar cap of Earth, the changing shape of the magnetic field lines bends the drift path induced by the electric field normal to the magnetic field. The centrifugal acceleration associated with this bending shoots the ions away from the Earth along the magnetic field lines. This effect provides more energy to heavy ions like oxygen compared to the lighter helium ions and protons. It is the changing shape of the field-lines that can be resolved by the use of the four Cluster spacecraft. 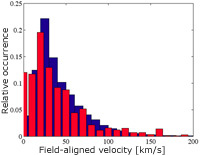 "And it turns out that the role of the centrifugal acceleration mechanism is significant and may explain a large fraction of the parallel velocities observed at high altitude above the polar caps", reports Nilsson in his paper published in the 4 February 2008 issue of Annales Geophysicae. "This scientific discovery is an excellent example of what can be done with the four satellites of the Cluster mission", says Philippe Escoubet, Cluster project scientist at the European Space Agency. Nilsson, H., et al., "An assessment of the role of the centrifugal acceleration mechanism in high altitude polar cap oxygen ion outflow", Ann. Geophys., 26, 145-157, 2008. Huddleston, M. M., et al., "An examination of the process and magnitude of ionospheric plasma supply to the magnetosphere", J. Geophys. Res., 110, A12202, 2005, DOI:10.1029/2004JA010401. Cladis, J. B., "Parallel acceleration and transport of ions from polar ionosphere to plasma sheet", Geophys. Res. Lett., 13, 893-896, 1986. Lennartsson, W., & Shelley, E. G., "Survey of 0.1- to 16- keV/e plasma sheet ion composition", J. Geophys. Res., 91, 3061, 1986. Arnaud Masson, Directorate of Science & Robotic Exploration, ESA, The Netherlands. Philippe Escoubet, Directorate of Science & Robotic Exploration, ESA, The Netherlands. Matt Taylor, Directorate of Science & Robotic Exploration, ESA, The Netherlands.